Angela is a third-year undergraduate student at UMaine, originally from Windham, New Hampshire. Angela studies Civil Engineering and is minoring in Math and Education, and, in addition to her work at the UMaine Composites Center, she’s also a member of UMaine’s swim team. Since she started in May, Angela has been working with faculty and staff to research the three-dimensional material/lamina properties for the composite tower of a full-scale offshore wind turbine. More specifically, she’s researching the properties of a Vectorply e-glass fiber with polyester resin for unidirectional, biaxial, and wound layers and the neat resin properties. With respect to plans for after graduation, Angela has a few directions in mind: she may teach English as a Second Language (ESL) abroad, or head towards graduate school to focus on structural engineering. 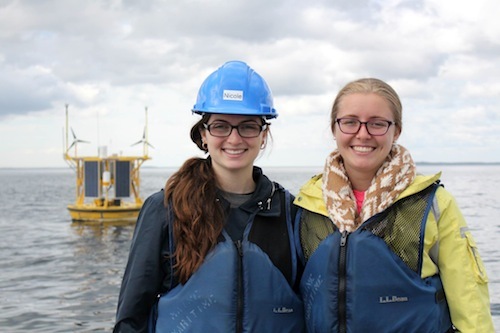 Nicole is a fourth year undergraduate student from Howell, New Jersey, who studies ocean engineering and marine biology at the University of Rhode Island. Nicole joins us as an intern through the National Oceanic and Atmospheric Administration (NOAA) Hollings Scholarship program. Since starting at the UMaine Composites Center this spring, Nicole is working with faculty and staff to perform a structural reliability analysis of a full-scale composite tower. Additionally, she’s researching classification agency codes to figure out how to do a probability based reliability analysis of the novel composite tower. After graduation, Nicole is considering graduate school at the University of Hawaii under NOAA’s Ocean Thermal Energy Conversion program.